Stuck in a rut or ready to add more poundage? All sorts of tricks and tips, both mental and physical, can lift you up to the next level. When you hit the gym, chances are you're focusing on one thing: adding more weight to the bar. If you want to get stronger and build more muscle, this is a no-brainer. You can always add more reps and sets, but the fast track to big gains is perceived to be piling on the plates. This said, you won't be able to add more weight each and every time you work out. But, if you follow these tips over time, you should notice a general upward trend in the number of those 45-pound slabs that end up on your bar. Note: These tips also work if you've hit a strength plateau and can't seem to break through. They'll give you the extra ammo you'll need to destroy your PR. If you're not training with any sort of pre-workout supplement or caffeine, now's the time to start. Caffeine is one of the most highly-used ergogenic aids and can give you a mighty boost in physical energy. It can sharpen your concentration, too. One mistake some lifters make is going straight for their heavy weight, often after a very light warmup set. That's probably not enough to prep your muscles for the abuse to come. Instead, start by doing one light set at 40-50 percent of your max load. As you do this light set, make sure you're activating your target muscles. You want every single fiber in these muscles fired up and ready to contract when the intense resistance kicks in. If you move straight to your PR—or work your way up to it gradually—you run the risk of fatiguing your muscles too soon and cutting your workout short. Many great athletes practice "seeing" themselves performing an exercise to perfection. They'll walk themselves through what they need to do, mentally visualizing every step in their process. If visualization works for them, you might want to try it with your next PR set. Using visualization doesn't mean you'll suddenly be able to add two more 45-pound plates to your squat. 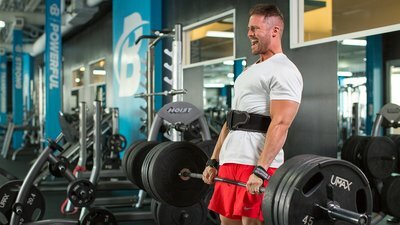 But, if you've been struggling to make that 10-pound jump from your previous PR, this technique could help you get the job done. Music is one of the best motivational aids for any kind of physical activity, so why not use it for packing on the plates? The trick is to choose one song that charges you up physically and emotionally. What's the one song that brings out your inner beast, that focuses your mind and elevates your pulse? Once you find that song, play it only when you do your PR set. Don't listen to it any other time—especially when you're not even at the gym. Pre-workout nutrition is a must to get optimum results from your program. Ask yourself, though: Are you perfecting your pre-workout nutrition? Or are you following standard protocol and mindlessly eating some protein with some carbs prior to your session? This basic approach might work if you aren't looking to hit a major PR. But when it's time to really step up to the plate (no pun intended! ), you need to dial-in your pre-workout nutrition plan to make sure your body has what it's going to need. Experiment with your pre-workout nutrition to see what works best for you. Does taking on a lot of carbs before a workout feel good, or bad? If it slows you down, restructure your day so your breakfast is big on carbs and protein, do the same at lunch, then have a protein-only snack midafternoon before you hit the gym. As long as you're eating enough high-quality carbs at those earlier meals, you should have all the glucose you need to power your workout. At this point, ask them to stop assisting you so you can focus on controlling the weight through the eccentric, lowering portion of the exercise. Most people will find that they're stronger during this portion, and able to complete it without assistance. Once you've finished the eccentric part of the rep, ask you partner to step in again and help you with the next concentric phase. Train negatives like this enough, and you'll be surprised the next time you try to wrangle some big weight through the concentric. If you've been training at the same gym for years, doing the same workout over and over again, the newness of another gym environment may inspire you to reach new heights.